Prof. (Dr.) Anjan Lal Dutta is an Interventional Cardiologist attached to Peerless Hospital and other leading hospitals in Kolkata. 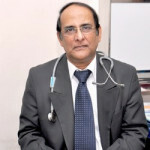 He is also a Professor of Cardiology at Vivekananda Institute of Medical Sciences, Kolkata. Dr. Dutta has published more than 100 research papers in Xavier's Indexed Journal. He is a regular invitee as faculty at various national and international conferences. Dr. Dutta is an active member of the Cardiological Society of India (CSI) and in the past has served as its President. Dr. Dutta is a Fellow of the American College of Cardiology (FACC) and also a Fellow of the CSI.